Refer to the following Web page to show certainly the latest description. cf. "Color Names - HTML Color Codes" or "HTML Color Values"
- For the Visited Link Color, the priority is higher than the "visitedlinkenabler (visited link enabler)". - cf. "Use mouse shortcuts", "Keyboard and Mouse Shortcuts" or "Shortcuts (Comparison Table)"
- You may use this main content script as an UserScript for Tampermonkey or Greasemonkey. - You may search Greasy Fork or OpenUserJS for some UserScripts. - You may use the icons below to the extent introducing the informations about this extension favorably. - You must not tamper the icons below. You may use width/height attributes/properties instead of resizing. 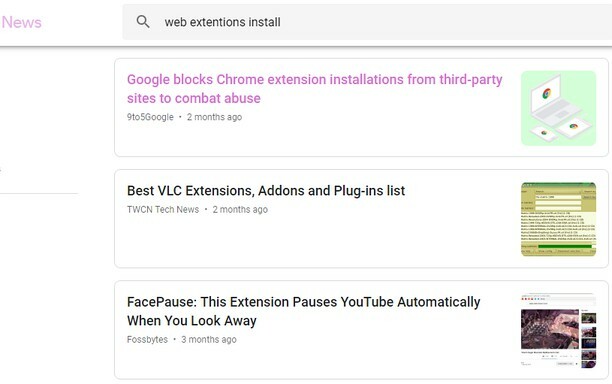 Check "Allow access to search page results" on the extensions list to use extensions on "www.google.co.?? ", etc. - You may use the main content script (googleNewsModernLiteralizer.js) as an UserScript for Tampermonkey or Greasemonkey. 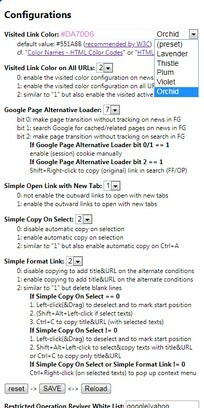 Copy and paste the main content script (googleNewsModernLiteralizer.js) of googleNewsModernLiteralizer for Firefox/Opera. Refer to https://developer.chrome.com/extensions/getstarted#manifest to load unpacked extension (e.g. googleNewsModernLiteralizer for Opera).